Below are some great tips for gardening with kids that you can use if you’re just starting or have been gardening with your kids for a while. 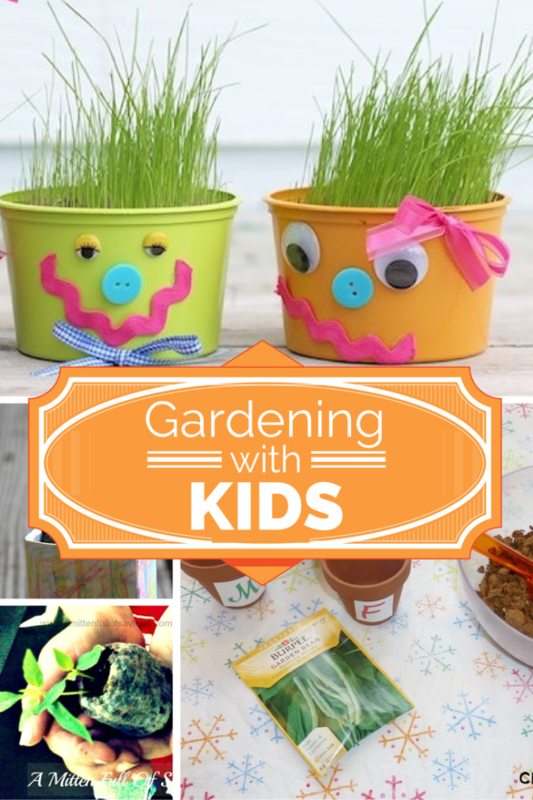 Gardening with Kids – Making It A Fun Family Activity ~How Does Your Garden Grow? Have you started gardening with your kids yet? I really like your idea to decorate the pots like that. The kids will love it! Already started to grow some tomatoes and we will do more in the next weeks. Fun! I cannot wait to start planting more now that it’s almost spring. Awesome, thanks! Our 9-year-old really wants to grow stuff. I bought him the little planter with see through tubes so you can watch the roots grow (can’t remember name of it – an as seen on TV thing). We haven’t even had much luck with that though lol. I suppose supposed to remove a couple from each tube so there’s only one (leave the one doing the best) but not sure how to do that. Anyways, my question is – what would you suggest for something easy to grow this time of year heading into spring? I have a small glass planter bowl with drainage to a plate attached on bottom – maybe five inches deep or so. Are there any foods or herbs you could suggest for this to set on the porch or next to it? I’d start with some herbs! Maybe a nice basil or parsley plant? What do you use most in the kitchen?